Despite the economic turmoil, latest benchmark figures show that email marketing is still a valuable marketing tool and is providing great results for UK businesses. 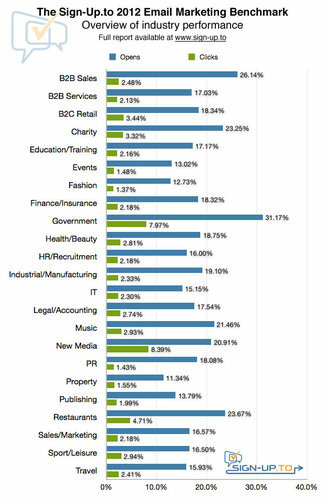 The 2012 UK Email Marketing Benchmark Report from Sign-Up.to shows an increase in average email open rates from 18.21% to 18.35% in the last 12 months across all sectors. 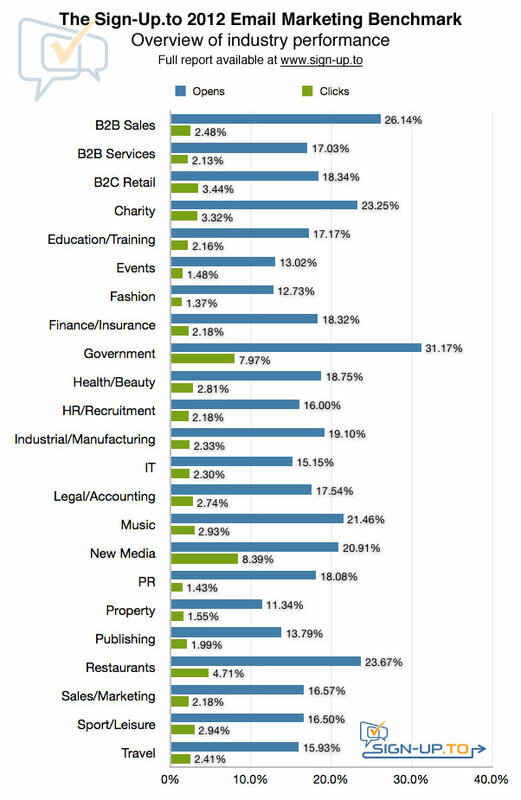 The report breaks down results across 23 industries and provides a great way for marketers to compare their performance against their peers. The business to business sales category leads the pack this year with an impressive average unique open rate of 26.14%, followed closely by restaurants with 23.67%. The music industry also performed well, with an average open rate of 21.46%. Outside of the private sector, government and charity email communications proved very successful too, notching up 31.17% and 23.25% open rates respectively. The report is the only UK focussed email marketing benchmark for small to medium sized businesses and is based on over 900 million emails sent using the Sign-Up.to platform last year. All emails are permission-based, sent to subscribers who explicitly opted in to hear from the sender. This press release was distributed by ResponseSource Press Release Wire on behalf of Global Publicity in the following categories: Business & Finance, Media & Marketing, for more information visit https://pressreleasewire.responsesource.com/about.